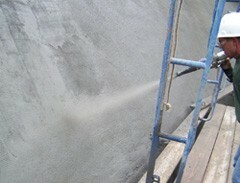 Five Star Structural Concrete® Gunite WP/FS is a wet process shotcrete applied, permanent concrete repair product. It is a high-strength, one component, enhanced hydraulic cement repair material. Five Star Structural Concrete® Gunite WP/FS may be used from 1/4 inch (6 mm) to full-depth applications and provides a long finishing time. Five Star Structural Concrete® Gunite WP/FS provides increased corrosion protection of steel reinforced structures with migrating corrosion inhibitor technology and low chloride ion permeability.